With High Endurance Technology, S3700 SATA MLC Enterprise SSDs can be fully rewritten up to ten times per day throughout their entire life. 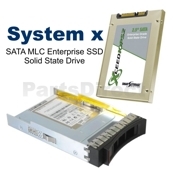 These solid-state drives provide outstanding performance, endurance, reliability, and energy efficiency for both read- and write-intensive enterprise applications, such as databases, data warehouses, corporate email and collaboration, actively connected users, medical imaging, and other applications. Rigorous testing of S3700 SATA Enterprise MLC SSDs by IBM through the IBM ServerProven program assures a high degree of confidence in storage subsystem compatibility and reliability.